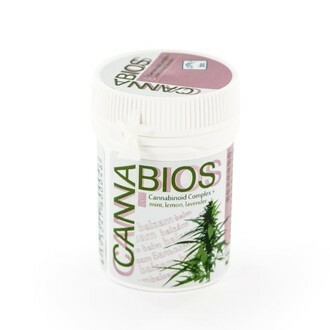 CBD Hemp Bio Balm with Mint, Lemon, Lavender by Cannabios is an organic CBD-rich hemp balm for all situations. The combination of natural essential oils of mint, lemon and lavender provides nourishing, moisturizing and soothing effects, relieving discomfort and calming the skin. The all-natural formula makes it the perfect choice for people with a sensitive skin. CBD Hemp Bio Balm with Mint, Lemon, Lavender by Cannabios is an all-natural CBD-rich hemp balm for all situations. The combination of revitalizing natural oils of mint, lemon and lavender makes this hemp balm a nourishing and moisturizing experience, ideal for everyday use and all situations - this unique blend of ingredients hydrates and protects the skin and lips, relieving discomfort and calming the skin. This balm contains only organic ingredients and is free from artificial fragrances, chemicals and preservatives. Cannabios' hemp bio balm is not tested on animals. Cannabis sativa extract: One of the main ingredients; this cannabinoid-rich extract is obtained from organically grown hemp plants. It contains a high amount of CBD, but is free from THC. Hemp seed oil: This oil is rich in omega-3 fatty acids - an important component for a healthy and vibrant looking skin. It helps in nourishing and moisturizing the skin. Mint oil: Mint oil improves the blood circulation and stimulates the nerves. Lemon Oil: Lemon oil is rich in Vitamin C, which is used by the skin to produce collagen - the protein responsible for ensuring that the skin stays young and elastic, as well as playing a role in healing wounds. Lemon oil is also soothing and has both anti-viral and antiseptic properties. It softens the skin and it rejuvenates it with its firming properties. Lavender Oil: Lavender oil has antiseptic and anti-fungal properties and helps to protect the skin. It makes this oil a good choice in the treatment of acne, as it inhibits the bacteria causing it. Lavender oil also acts as a muscle relaxant. Olive oil: Olive oil is an essential part of any natural skin balm. It is very nutritious and jam-packed with essential vitamins, all of which are used by the skin to stay it healthy, young and free from irritation.